The master wizard is dead! You must fight against four other wizards to gain control over the land. You, as well as your minions, gradually gain experience and your different units have a wide variety of abilities which you must use to the fullest. You also get to take all units that have survived a battle, into the ensuing one. Furthermore, You can gain the upper hand in each battle by capturing and defending key towers. This enables you to summon more minions during each turn of the battle. 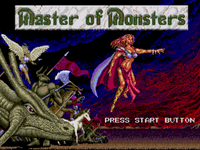 Master of Monsters is a turn based game in which good strategy is the key to victory.